25 U.S.C. ch. 9 § 331 et seq. 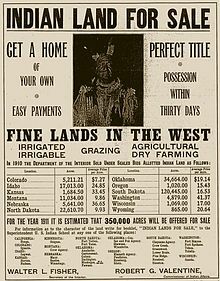 The Dawes Act of 1887 (also known as the General Allotment Act or the Dawes Severalty Act of 1887),   authorized the President of the United States to survey Native American tribal land and divide it into allotments for individual Native Americans. Those who accepted allotments and lived separately from the tribe would be granted United States citizenship. The Dawes Act was amended in 1891, in 1898 by the Curtis Act, and again in 1906 by the Burke Act. The Act was named for its creator, Senator Henry L. Dawes of Massachusetts. The objectives of the Dawes Act were to abolish tribal and communal land ownership of the tribes into individual land ownership rights in order to transfer lands under Native American control to white settlers and stimulate assimilation of them into mainstream American society, and thereby lift individual Native Americans out of poverty. Individual household ownership of land and subsistence farming on the European-American model was seen as an essential step. The act provided that the government would classify as "excess" those Indian reservation lands remaining after allotments, and sell those lands on the open market, allowing purchase and settlement by non-Native Americans. The Reservation system, though forced upon Native Americans, was a system that allotted each tribe a claim to their new lands, protection over their territories, and the right to govern themselves. With the Senate supposedly being able to intervene only through the negotiation of treaties, they adjusted their ways of life and tried to continue their traditions. The traditional tribal organization, a defining characteristic of Native Americans as a social unit, became apparent to the non-native communities of the United States and created a mixed stir of emotions. The tribe was viewed as a highly cohesive group, led by a hereditary, chosen chief, who exercised power and influence among the members of the tribe by aging traditions. The tribes were seen as strong, tight-knit societies led by powerful men who were opposed to any change that weakened their positions. Many white Americans feared them and sought reformation. The Indians' failure to adopt the "Euroamerican" lifestyle, which was the social norm in the United States at the time, was seen as both unacceptable and uncivilized. The Act facilitated assimilation; they would become more "Euro-Americanized" as the government allotted the reservations. Native Americans held specific ideologies pertaining to tribal land, to them the land and earth were things to be valued and cared for, it represented things that produced and sustained life, it embodied their existence and identity, and created an environment of belonging. In opposition to their white counterparts, they did not see it from an economic standpoint. The Burke Act of 1906  amended the sections of the Dawes Act dealing with US Citizenship (Section 6) and the mechanism for issuing allotments. The Secretary of Interior could force the Native American Allottee to accept title for land. US Citizenship was granted unconditionally upon receipt of land allotment (the individual did not need to move off the reservation to receive citizenship). Land allotted to Native Americans was taken out of Trust and subject to taxation. The Burke Act did not apply to any Native Americans in Indian Territory. The amount of land in native hands rapidly depleted from some 150 million acres (610,000 km2) to a small 78 million acres (320,000 km2) by 1900. The remainder of the land once allotted to appointed natives was declared surplus and sold to non-native settlers as well as railroad and other large corporations; other sections were converted into federal parks and military compounds. The concern shifted from encouraging private native landownership to satisfying the white settlers' demand for larger portions of land. ... the Secretary of the Interior may, in his discretion, and he is hereby authorized, whenever he shall be satisfied that any Native American allottee is competent and capable of managing his or her affairs at any time to cause to be issued to such allottee a patent in fee simple, and thereafter all restrictions as to sale, encumbrance, or taxation of said land shall be removed. The allotment policy depleted the land base, ending hunting as a means of subsistence. According to Victorian ideals, the men were forced into the fields (but the Native Americans thought this made them take on what in their society had traditionally been the woman's role, and the women were relegated to the domestic sphere). [ citation needed] This Act imposed a patriarchal nuclear household onto many matrilineal Native societies, in which women had controlled property and descent. In 1926, Secretary of the Interior Hubert Work commissioned a study of federal administration of Indian policy and the condition of Native American people. Completed in 1928, The Problem of Indian Administration – commonly known as the Meriam Report after the study's director, Lewis Meriam – documented fraud and misappropriation by government agents. In particular, the Meriam Report found that the General Allotment Act had been used to illegally deprive Native Americans of their land rights. After considerable debate, Congress terminated the allotment process under the Dawes Act by enacting the Indian Reorganization Act of 1934 ("Wheeler-Howard Act"). However, the allotment process in Alaska, under the separate Alaska Native Allotment Act, continued until its revocation in 1971 by the Alaska Native Claims Settlement Act. Despite termination of the allotment process in 1934, effects of the General Allotment Act continue into the present. For example, one provision of the Act was the establishment of a trust fund, administered by the Bureau of Indian Affairs, to collect and distribute revenues from oil, mineral, timber, and grazing leases on Native American lands. The BIA's alleged improper management of the trust fund resulted in litigation, in particular the case Cobell v. Kempthorne (settled in 2009 for $3.4 billion), to force a proper accounting of revenues. For nearly one hundred years, the consequences of federal Indian allotments have developed into the problem of fractionation. As original allottees die, their heirs receive equal, undivided interests in the allottees' lands. In successive generations, smaller undivided interests descend to the next generation. Fractionated interests in individual Native American allotted land continue to expand exponentially with each new generation. Today,[ specify] there are approximately four million owner interests in the 10,000,000 acres (40,000 km2) of individually owned trust lands,[ citation needed] a situation the magnitude of which makes management of trust assets extremely difficult and costly. These four million interests could expand to 11 million interests by the year 2030 unless an aggressive approach to fractionation is taken. [ citation needed] There are now single pieces of property with ownership interests that are less than 0.0000001% or 1/9 millionth of the whole interest, which has an estimated value of .004 cent. The economic consequences of fractionation are severe. Some recent appraisal studies[ specify] suggest that when the number of owners of a tract of land reaches between ten and twenty, the value of that tract drops to zero. Highly fractionated land is for all practical purposes worthless. ^ "General Allotment Act (or Dawes Act), Act of Feb. 8, 1887 (24 Stat. 388, ch. 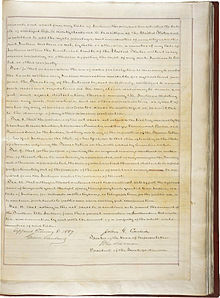 119, 25 USCA 331), Acts of Forty-ninth Congress-Second Session, 1887". Retrieved 2011-02-03. 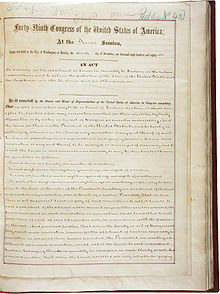 ^ a b "Dawes Act (1887)". OurDocuments.gov. National Archives and Records Administration. Retrieved 2015-08-15. ^ "The Thirties in America: Indian Reorganization Act" Archived 2013-08-28 at the Wayback Machine, Salem Press, Retrieved August 13, 2013. ^ "Dawes Severalty Act Amendments of 1891 (Statutes at Large 26, 794–96, NADP Document A1891)". Retrieved 2011-02-03. ^ "Burke Act (34 Stat. 182) Chapter 2348, May 8, 1906. [H. R. 11946.] [Public, No. 149.]". Archived from the original on 2011-05-25. Retrieved 2011-02-03. ^ Bartecchi D (2007-02-19). "The History of "Competency" as a Tool to Control Native American Lands". Pine Ridge Project. Archived from the original on 2008-12-11. Retrieved 2008-11-06. ^ Ellen Fitzpatrick, History's Memory: Writing America's Past, 1880–1980 (Cambridge: Harvard University Press, 2004), ISBN 0-674-01605-X, p. 133, excerpt available online at Google Books. Olund, Eric N. (2002). "Public Domesticity during the Indian Reform Era; or, Mrs. Jackson is induced to go to Washington." Gender, Place, and Culture 9: 153-166. Stremlau, Rose. (2005). "To Domesticate and Civilize Wild Indians": Allotment and the Campaign to Reform Indian Families, 1875-1887. Journal of Family History 30: 265-286.